Standard view binder offers a crystal-clear overlay on front, spine and back cover for customization. Sheet lifters in the 3" capacity. Interior storage compartment for loose materials. Binder has concealed rivets. 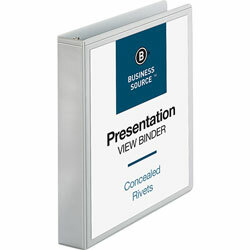 2" White View Binders from Business Source! 3669 In Stock today.